Glenn Curtiss had a very active childhood and no one could ever remember him taking the time to have a schoolboy crush. All of his friends were very surprised to learn that he was seriously smitten with Lena Pearl Neff, a relative newcomer to Hammondsport, NY, when he was 18. Glenn was returning home to Hammondsport from one of his regular bicycle trips to visit his mother in Rochester, a distance of 20 miles, when he noticed a young woman tending grapes by the side of the road. Feeling rather hot and tired, he stopped to ask her for a drink of water. She quickly ran to a house and returned with a bucket of cool spring water. Amazingly, he worked up the courage to ask for a date before jumping on his bicycle and speeding away. Lena, two years younger than Glenn, had recently moved from Wheeler, a village 10 miles west of Hammondsport, with her father and mother. At the time she met Glenn, she was working as a seasonal employee in the local vineyard, as was customary for local young ladies at the time. Lena was described by acquaintances as “just an ordinary country girl,” but Glenn saw her as a beauty and lost his heart in her dark brown eyes. 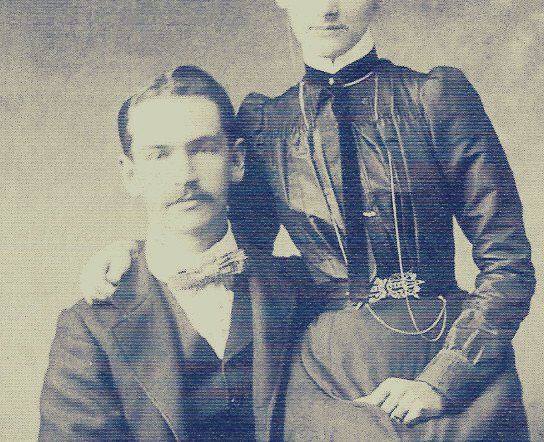 Lena and Glenn got married on March 7, 1898 when he was just nineteen, going on twenty, and she was only seventeen. On the Register of Marriages, he wrote that he was twenty-one, because he did not have his mother’s permission and he was underage. Relatives later told stories about how his mother, Lua Adams, tried several times to break up the marriage. On that same Register, Glenn stated he was a photographer by trade; it just didn’t seem right to him for a married man to be a bicycle/motorcycle racer. He had taken up photography while working at Eastman Kodak several years earlier, and went to work at Saylor’s, a local photography studio. He gladly accepted out-of-town assignments and would shoot pictures of rural families, horses and barns on his way to and from regional races. Glenn and Lena moved in with Grandmother Ruth Curtiss on Castle Hill. The quiet couple settled in nicely to their new lifestyle to the delight of his grandmother. She was getting on in years and her eyesight was failing her. Lena had a very gentle way with her and helped her around the house while Glenn was working all of his jobs and riding in races. It was about this same time that Glenn grew a moustache. He believed that no one would take him seriously because of his age, and thought the moustache would give him the maturity he craved. He kept it throughout his life, and it certainly made him look serious and mature. As a matter of fact, it may have made him look too serious. Those who did not know him well were very surprised to learn that he had a great sense of humor along with his intense desire to be the fastest man on earth.